What Is “Wireless”? Wireless uses radio frequency transmission to connect the user to the network - in effect replacing patchcords, allowing the final connection from the network to the user to be done over radio link. 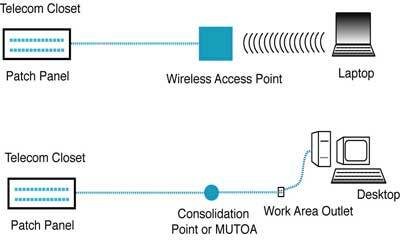 Wireless allows the user to roam unencumbered by cabling within the service area covered. WiFi (IEEE 802.11) is probably most important to the typical structured cabling installer. No corporate network can probably be built without wireless today - people want to be mobile. Practically everybody uses a laptop connected on WiFi as their primary computer, excepting engineers or graphic designers at workstations and most of them will have a laptop as a second computer to carry, along with everybody else, on trips and to meetings where everybody brings their laptops and connects on WiFi. Besides laptops on WiFi, people use tablets and smartphones for wireless communications. Smartphones allow web browsing with connection over either the cellular network or a WiFi network. Some mobile phones are capable of connecting over WiFi to make phone calls. While WiFi has had some growing pains and continual upgrades, the IEEE 802.11ac standard it has become reliable and offers adequate bandwidth for most users. The desire for mobility, along with the expansion of connected services, appears to lead to a new type of corporate network. The cabling consists of a fiber optic backbone with copper to the desktop for people who want direct connections (maybe fiber to the desk for engineering or graphics users) and for everyone else, multiple wireless access points, more than is common in the past, for full coverage and maintaining a reasonable number of users per access point is the new norm for corporate networks. Wireless is not “wireless,” as every antenna location (called an access point - AP or WAP) must be connected into the network cabling to communicate with the network electronics. The wireless connection really only replaces the patchcord that would otherwise connect the user into the network. 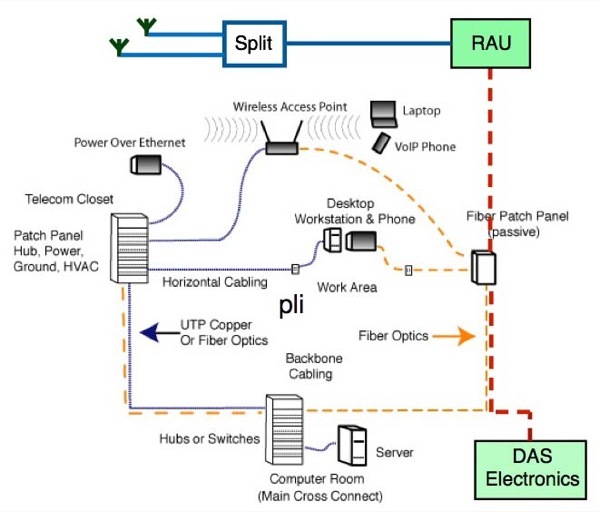 Thus every AP must have a connection into the network, either over UTP copper cable or fiber. APs are available with either type of connection and fiber versions are not that much more expensive today. Wireless offers several challenges to the installer and user. First, it is important to provide good coverage in the work area. This involves installing multiple APs with overlapping coverage. The coverage any AP provides depends on the environment, as objects like walls, office partitions, desks and even people absorb or reflect signals, affecting coverage. 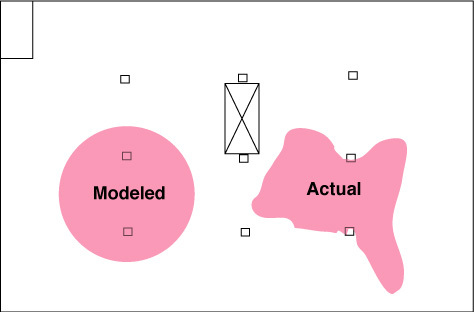 Manufacturers’ diagrams often look like the figure below with coverage a nice circle, while actual coverage looks more like the blob shown to the right. Versions of WiFi use reflections off office spaces to enhance it's performance, so deciding where to site access points often requires a knowledgeable wireless tech scanning the office using sophisticated test gear. Security is the next -and perhaps biggest- problem for wireless. Any AP is a potential security flaw for those wishing to breach your network. Any company’s connection to the Internet will have a firewall to prevent unauthorized entry by those outside the network, but some any access point offers easy access, even to someone sitting in a car outside on the street. Securing wireless networks requires connecting them not to just any switch in the network, but to wireless controllers that filter any traffic from the AP to authorize users and monitor traffic. Controllers can also provide guest access, for example allowing guests to access the Internet but preventing unauthorized access to the corporate network. Wireless controllers must also be able to identify unauthorized APs plugged into the network, as employees are known to have done, as they are likely to be totally insecure. WiFi was originally referring only to IEEE 802.11b version of the wireless standard, but to reduce confusion, it was expanded to include all versions of 802.11. WiFi is the version of wireless networks most users are familiar with. Most laptops now support WiFi connections and many offices already have installed access points. It is also the version most likely to be installed by premises cabling contractors, but metropolitan networks built using WiFi will primarily be outside plant installations connecting over singlemode fiber. 802.11: applies to wireless LANs and provides 1 or 2 Mbps transmission in the 2.4 GHz band using either frequency hopping spread spectrum (FHSS) or direct sequence spread spectrum (DSSS). 802.11 is effectively obsolete. 802.11a: an extension to 802.11 that applies to wireless LANs and provides up to 54 Mbps in the 5GHz band. 802.11a uses an orthogonal frequency division multiplexing encoding scheme rather than FHSS or DSSS. 802.11b (also referred to as 802.11 High Rate or Wi-Fi): an extension to 802.11 that applies to wireless LANS and provides 11 Mbps transmission (with a fallback to 5.5, 2 and 1 Mbps) in the 2.4 GHz band. 802.11b uses only DSSS. 802.11b was a 1999 ratification to the original 802.11 standard, allowing wireless functionality comparable to Ethernet. 802.11g: applies to wireless LANs and provides 20+ Mbps in the 2.4 GHz band. 802.11n: uses multiple channels and frequencies to transmit data at higher rates (~100 Mb/s) while still offering compatibility to previous 802.11 versions. 802.11ac: uses multiple channels and frequencies to transmit data at still higher rates (up to ~500 Mb/s throughput) while still offering compatibility to previous versions. Sometimes referred to as 5G WiFi. 802.11ad "WiGig" is a tri-band Wi-Fi using 60 GHz, that can achieve a theoretical maximum throughput of up to 7 Gbit/s. Which wireless version should be chosen? The latest, of course! WiFi wireless standards are developed by the IEEE 802.11 committee, and standards are already up to version “n” (802.11n) and version "ac" coming soon. Many current networks use 802.11g or n which offer adequate bandwidth for most users and enough channels (frequencies) to accommodate multiple access points for good coverage. The higher bandwidth version now more commonly used, called “ac” trades channel selection for bandwdth by transmitting part of the signal over one of several frequencies, similar to GbE which uses all 4 UTP pairs simultaneously. It is important to note that the b, g and n versions are interoperable. Bluetooth is a limited distance network for consumer devices. It has been used to connect a wireless printer or mouse to a PC, wireless headsets to cell phones and stereos, cell phones to cars for hands-free operation, digital cameras to printers, etc. 802.15 is a communications specification that was approved in early 2002 by the Institute of Electrical and Electronics Engineers Standards Association (IEEE) for wireless personal area networks (WPANs). The initial version, 802.15.1, was adapted from the Bluetooth specification and is fully compatible with Bluetooth 1.1. In terms of installation, Bluetooth is built-in to many devices and plugged into USB ports or added as cards to PCs, not installed as access points like WiFi, so it is not generally of interest for cabling installers. WiMAX is a further development of wireless network technology that expands the data capacity of wireless to ~ 100 Mb/s and it’s distance capability to several miles. WiMAX is still in the development stage, where WiFi is well established. Unlike WiFi which was primarily a short distance network aimed at private networks, WiMAX appears aimed at communications carriers who could use it in place of landline networks, substituting WiMAX, for example, for Fiber To The Home, in areas needing upgrades of their networks or using it to allow notebook PC or PDA roaming in a metropolitan area. Like all networks, WIMAX needs a lot of standards work, here under the IEEE 802.16 committee. Products are already available, but many users are awaiting final standards and interoperability before committing to the technology. WiMax networks will look more like cellular networks, built into the local geography like cellular phone infrastructure, requiring negotiating frequency allocations and antenna locations. WIMAX installations will primarily be outside plant installations connecting over singlemode fiber. Bringing broadband to the rural areas of the US or any large country with sparse population can be very expensive. The US has a plan, however, that may make it more affordable. "Super WiFi" is not your usual WiFi. It is using WiFi protocols but broadcasting on frequencies of unused TV channels, called "white space." The FCC is ready to open up new frequencies to broadband to allow delivering broadband Internet and phone to rural areas where cabling is too expensive. Super WiFi works at a lower frequency than either regular WiFi or cellular systems so it has more reach into areas that are too rugged for most wireless systems. Usage in more urban areas may be a problem however, if there are too many broadcast TV stations which can interfere with Super WiFi signals (and vice versa.) These antennas will also require fiber to connect into the network. Cellular phone networks are the largest wireless networks with billions of users worldwide. Every day, more of those users are accessing data services using smart phones, tablets or PCs with wireless adapters. These networks are generally outside plant networks but ~80% of all calls originate indoors. To accommodate this cellular traffic, a DAS - distributed antenna system - is installed in large buildings like convention centers, sports facilities or tunnels where cellular services would not be otherwise available. These networks generally use singlemode optical fiber to connect lower power cellular antennas indoors. The architecture of the DAS cabling is no different from an Ethernet LAN or standardized structured cabling. In some cases, DAS systems can be monitored by network management software used for LANs. A DAS and WiFi network are both usually included in an installation since both serve similar purposes. Smartphones will generally choose to operate over WiFi networks when WiFi has more available bandwidth. Is All Wireless Really Wireless? Wireless is only wireless to the final user, since radio spectrum is scarce and far too valuable to use for connecting antennas or access points. Cell phone towers you see everywhere are generally connected on fiber optics to the rest of the phone network - which is also fiber optics. The exception is when the towers are located in rugged terrain, where antennas provide radio relay. WiFi access points are part of structured cabling, tied into the same Ethernet network as any other Ethernet device. 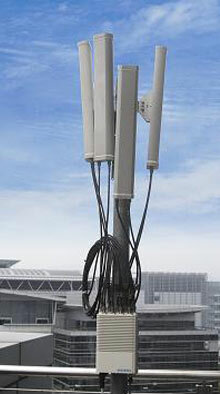 Convention centers and other large buildings where cell phone coverage may be spotty often use cabled antennas inside the facility to provide higher quality connections. 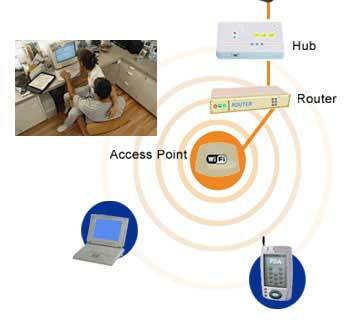 Networks need Wi-Fi access points or gateways to serve as the central base station for the network. A typical Wi-Fi access point can support some 15 to 20 users, so most homes and small offices need only a single access point. However, if you have a very large dwelling (or house) or if your office is spread out, you may need more. A basic rule of thumb is wireless AP coverage is <300 feet indoors and <2000 feet outdoors. Your range may vary, based on the building or environment you're using it in. Of course, the number of access points depends on how the network is used and the total number of users, as well as how big a space needs to be covered. A single access point can easily handle from 10 to 30 users who only use the network to send e-mail, cruise the Internet and occasionally save and retrieve large files. Within a typical office environment, most access points can provide good wireless coverage up to 300 feet or so. For large facilities with many users, or with users who require a lot of bandwidth, you may need more than a single access point to provide adequate coverage for all users. With Wi-Fi, speed decreases the farther the user is from the base station. For example, close to the base station, a "g" Wi-Fi computer should be able to get the full 11 Mbps data rate. Move farther away, and depending on environment, the data rate may drop to 1 Mbps. 1 Mbps throughput is still a perfectly acceptable performance level, if you're sending and receiving e-mail, cruising the Internet or just performing data entry tasks from a mobile computer. An access point looks like zone cabling, in that is it is connected to the network with cable and flexibly allows connections to end users. Zone Cabling: Instead of horizontal wiring going directly to the work area, terminate multiple horizontal cables at a multi-user telecommunications outlet assembly (MUTOA). MUTOAs may be located above the ceiling or or a common wall or partition. It’s an ideal solution for open offices. Generally serves fewer than 12 connections. Short patchcords to work area provide user connections. Zone cabling makes networks easier and less expensive for MACs (moves, adds and changes). The wireless access point is connected to the network on cabling (UTP or fiber) The access point may be mounted in many locations, but locations should be chosen for best range, e.g. ceiling, wall, on modular furniture or a desktop. Wireless design requires a comprehensive review of customer premises and needs. Vendors can provide much useful information on the design process. The TIA TR-42 committee that writes structured cabling standards has written TSB-162 with guidelines for designing cabling for access points. Do you need isolated areas? That is, should wireless coverage be limited to certain areas? some vendors recommend no more than 6 users to reduce traffic slowdowns. What types of equipment are they using? Laptops, desktop computers, PDAs, VoIP phones? it is to be used for transferring large files like watching videos. Trade off range for data rates. More access points close together will provide greater data rates, at a higher cost. Other equipment can radiate emissions that interfere with wireless or it may be susceptible to interference from wireless, potentially critical in some applications like hospitals. Sources of intereference include common items like garage door openers or other remote controls. Other wireless networks like Bluetooth or even garage door openers that operate on similar frequencies can cause problems. In some cases, access points with overlapping coverage can cause problems, but this can be solved by setting adjacent access points to alternating channels. Building features like metal structural beam or doors can absorb or reflect wireless signals causing problems. Moving vehicles outdoors may reflect signals randomly causing problems outdoors. Siting antennas high can overcome this problem. Antenna directivity (directional or omnidirectional) can help in gaining proper coverage without interference. What are network constraints? Will it be only data or is VoIP involved? Can current network handle additional traffic or will it need upgrading? Where will access points be cabled to? Is there space in the telecom closet? How will additional cabling be installed? Does conduit or cable trays need to be installed also? The higher speed versions of WiFi use multiple data channels and frequencies to achieve higher data rates. 802.11ac networks need at least 1Gb/s or more if multiple frequency APs are used. To accommodate this, the Ethernet committee has standardized new versions of Ethernet at 2.5Gb/s and 5.0Gb/s. These new Ethernet standards are designed to operate over the same cabling as Gigabit Ethernet - Cat 5e - so the wireless APs can be upgraded to high speed versions without replacing most cabling used for the lower speed APs. Security is the #1 problem with wireless networks. If a wireless router is added to a network that has a direct connection to the corporate servers, it provides a convenient entry point for hackers, and password protection is inadequate - it can be cracked! Special wireless routers are available and they should be on separate backbones from wired outlets. The access point needs power, which can be supplied from AC power or PoE (power over Ethernet - see below.) If AC power is used, it must be installed with proper grounding and UPS backup. Many APs use Power over Ethernet (PoE). The Power over Ethernet standard IEEE Ethernet standard (802.3af) allows using network UTP cabling to send power over UTP conductors to power remote devices that need power to operate, such as WiFi wireless access points, VoIP phones, hubs or switches without local power access. Power Hubs located in wiring closets provide power to cabling. It is part of the IEEE Ethernet standard (802.3af), developed with the cabling system manufacturers and is considered in cabling standards. With wireless systems, it’s very hard to predict network performance without the use of the proper test equipment. Testers will give you a visual picture of the site to help understand where access points should be placed. 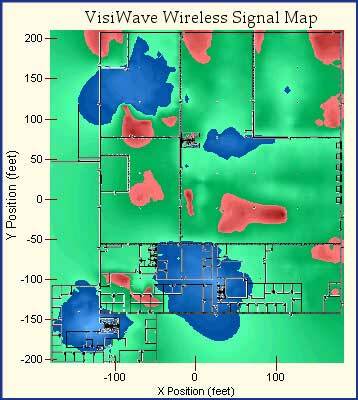 (Visiwave shown) The complexity of a site survey will be determined by the size of the network and the of the site. A good site survey will make the installation easier and the quality of network service much better. More: See the FOA page on "Fiber For Wireless"